Adobe Audition CC helps in recording audio files, adjusting record levels and working with playback controls. It helps in importing audio files and browse through media before importing. It allows the user to find and remove unwanted sounds and background noise and learn how to export clips in the proper format. While working on a project, automatically generate a volume envelope to duck music behind dialogue, sound effects or any other audio clip using the Ducking parameter in the Essential Sound panel. This feature simplifies the steps needed to achieve professional-sounding audio mixes. When recording punch-ins or layering sounds, clip Z-order is now maintained when selecting stacked clips so that smaller clips don’t get lost behind longer ones. Commands in the clip content menu make it easy to move clips to the front or back and preferences allow users to customise the behaviour. More improvements allow for symmetrical clip fades or adjusting fade curves or duration independently. This release of Audition includes support for the Mackie HUI control surface protocol. To control your mix, transport and automation in Audition, use HUI emulation mode with almost all modern control surfaces. 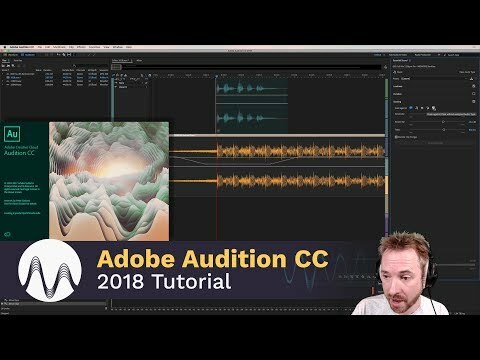 A new, modern version of the classic but discontinued Adobe Premiere Pro Dynamics audio effect has been introduced to Audition and Premiere Pro CC. This simple yet powerful plug-in offers a compressor, expander, limiter and noise gate in one easy-to-use tool. Input monitoring allows you to preview the input coming from your recording device before starting the actual recording by either observing the level metres or listening to it. This release of Audition lets you view session and media timecode overlays in the Video panel. You can also lock your video output to your external display. The timecode overlay displays the current time display string as an overlay on the Video panel and the video fullscreen monitor. Multichannel audio workflows allow you to separate all audio channels to unique clips automatically. You can customise the channels assigned to a clip and adjust Specific Channel Routing. This feature enhances the Edit in Audition workflow when sending Premiere Pro sequences to Audition. Audition now supports Premiere Pro project files as the default interchange format. This allows transferring significantly more information to Audition, such as Effects and their Parameters, Submixes and Essential Sound Panel settings. Many existing audio effects now have spectrum metres, gain metres and gain reduction metres. You can use the frequency spectrum to identify imbalances in audio and use control points to correct them. Level Metre shows the input level of the audio and Gain Reduction Metre shows how audio signals are compressed or expanded. Q. How do I download and install Audition? You can download Audition from the Creative Cloud apps catalog. You'll need to sign in with your Adobe ID and password to complete the download. For more information, including how to install older versions or check for updates, see Download and install Creative Cloud apps. Q. Why won't Audition install? Q. Can I download a trial copy of Audition? Q. Can I install Audition on another computer?